This charming boutique hotel in central Lucknow is a 41-room heritage home that got converted into a hotel a couple of years ago. 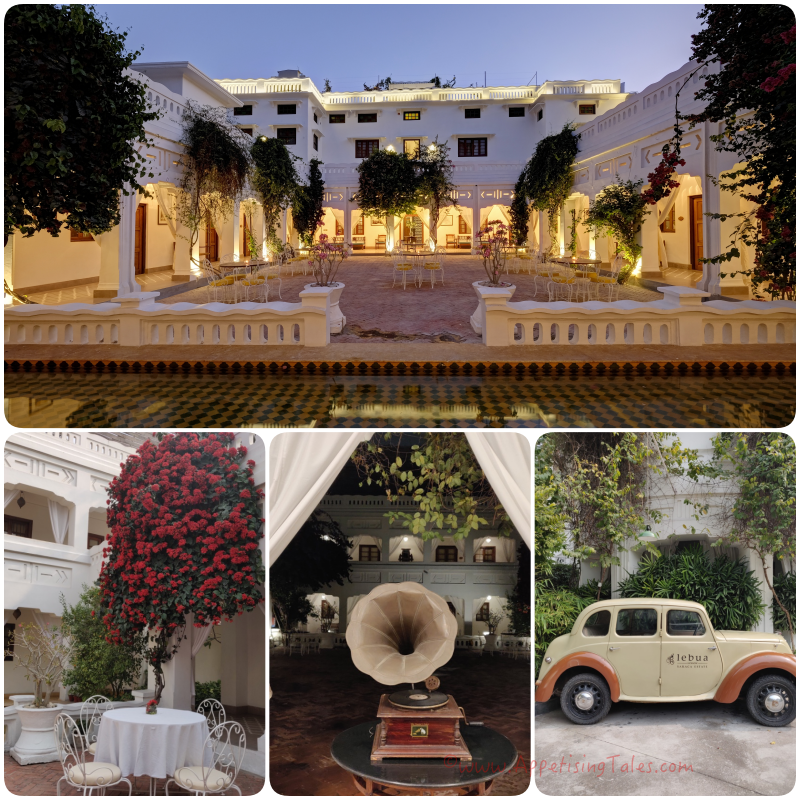 The warm and efficient team behind this lovely property showcases the beautiful heritage of the city both within and outside the hotel. With an architecture style of the early 1900s, the clean white façade of the lebua Lucknow ensconces a unique serenity despite its location in the heart of the city. Almost as soon as you enter the hotel’s gate one is transported back to a different era with a couple of vintage cars parked under the porch that add to the feeling of being in a time warp. 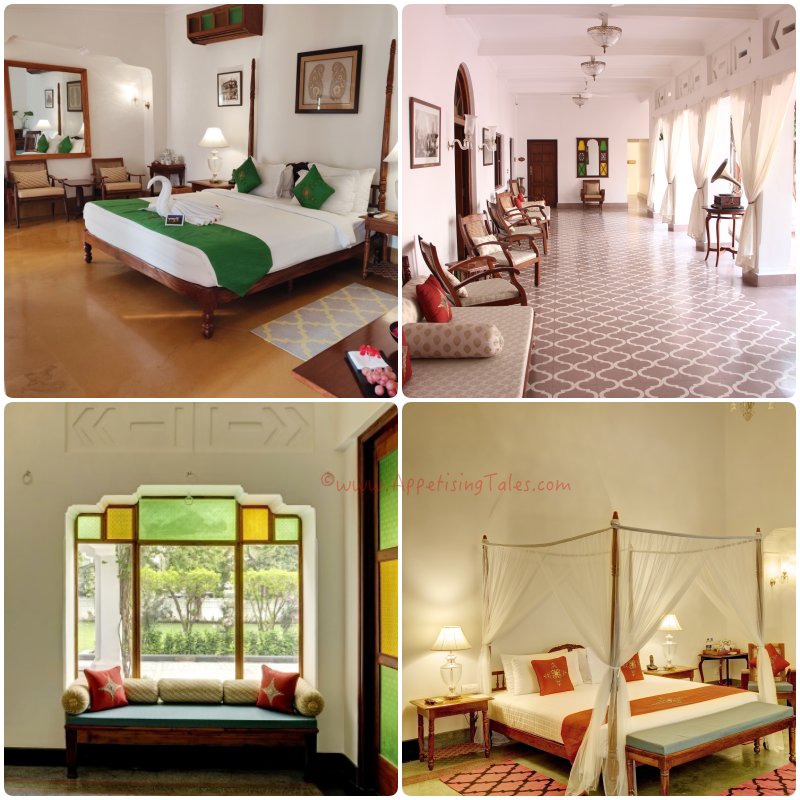 Inside, a high ceiling, period furniture and black and white photographs of Lucknow through its varied eras lend a simple charm that I experience all through the weekend that I spend here. Although lebua is a swanky Bangkok-based hotel chain, in India they have retained the local flavour of the city that they’re based in. Lucknow is known for its nawabi havelis or traditional mansions that are characterized by open courtyards around which the rooms were built. Many rooms thus open into, Sehen, a large courtyard with a water-body at one end and many flowering bougainvillea creepers adding a burst of colour against the white portico. My suite comes with a huge balcony overlooking the verdant front lawn of the hotel. Inside my room, while laying on my four poster bed it is easy to imagine the life of erstwhile royalty as sunlight streams in from stained glass windows, dappling through Mughal style arches. If Lucknow’s architecture is a talking point, its nuanced cuisine is the highlight of any conversation among food lovers. The subtlety of flavours can only be achieved by highly experienced chefs or homecooks who are armed with family recipes since precision of spices and expert technique are required to create even the most simple looking dishes. 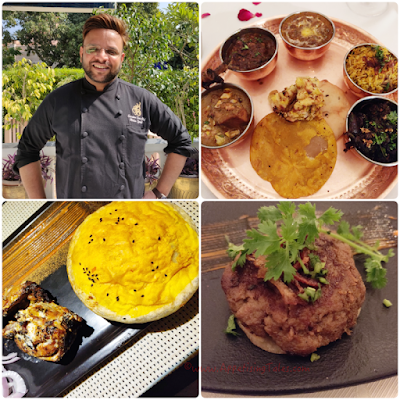 Chef Mohsin Qureshi, executive sous chef, has taken great care to serve traditional Lucknowi food prepared in an authentic style. You must try the thali, a plated meal that contains an array of vegetables, meats, curries and breads. I assure you that the spread is so lavish that you will do well to skip the prior meal to do justice to this one. The melt in the mouth kebabs with the accompanying rotis, chicken and lamb cooked to perfection in the tandoor will leave you licking your fingers. But there is more than local food to savour here. 1936 an Italian restaurant with an alfresco space is the ‘it spot’ for locals to enjoy freshly made salads, lavish cheese platters, hearty bowls of pasta or European style grills. And Saraca the rooftop bar is ideal for a nightcap under a starlit sky. The lebua team also does a super job at creating the perfect ambience to enjoy all the delectable food on offer. 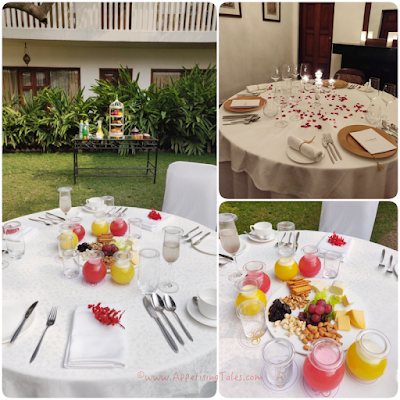 From candle-lit dinners decorated with rose petals to private al fresco breakfasts with an array of freshly made croissants and muffins they create very romantic settings, but of course at an additional cost. Lucknow is not yet on the tourism map of India. Yet this city is replete with pre-Independence heritage and architecture and part of that vibe still lingers in the daily life of city dwellers. lebua Lucknow curates local experiences to showcase the best culinary and architectural delights of the city beyond its walls as well. 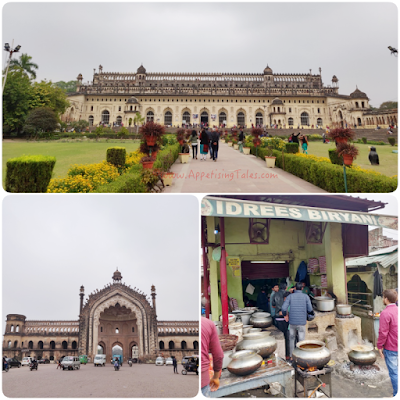 If you have the time I highly recommend that you take one of the guided tours to enjoy the famous landmarks of the city like the Turkish-inspired Rumi Darwaaza or the iconic Bara Imambara. These tours can be customized to suit your interest and can include a visit to one of India’s finest schools for boys, La Martiniere College that was founded by a Frenchman appointed by the East India Company or the British Residency to delve into the multi-layered history of the city. And if you have the palate for streetfood, a culinary walk through the bylanes of Old town and Hazratganj will unveil some real gems like aromatic biryanis, kebabs and sweet dishes that you are unlikely to find in any other city in India. 19, Mall Avenue, Lucknow – 226001, Uttar Pradesh, India. This article first came out in a leading UK-based travel publication in March'2019.